Flip a coin. 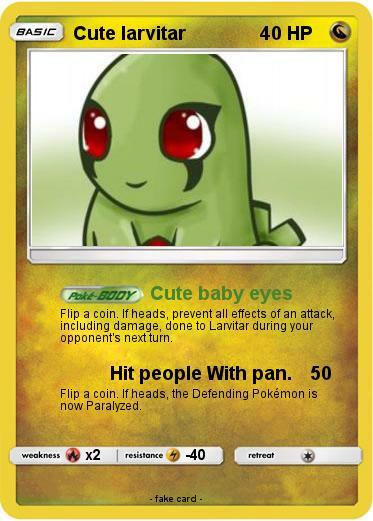 If heads, prevent all effects of an attack, including damage, done to Larvitar during your opponent's next turn. Attack 2 : Hit people With pan. Larvitar | Larvitar | Larvitar | Larvitar | Larvitar | Larvitar | Larvitar | larvitar | Larvitar | Larvitar | Larvitar | larvitar | Larvitar | Larvitar | Larvitar | Larvitar | larvitar | Larvitar | Larvitar | Fat Larvitar | Larvitar | Larvitar | Larvitar | Larvitar | Larvitar | Shiny Larvitar | Firered Larvitar | Shiny Larvitar | Larvitar Delta Species | larvitar 555555555555 | cute... so they think 4 | my cutly smoches | Cuteness Harrison | Shiny Larvitar | Cute pikachu | Cute Bulbasaur | Start Cute Pokemon | CUTE KYOGRE 90000000000 | Cute Pikachu lv.30000 | CUTE OVRRLOAD | Cute Lego Head | cute kitten | _________'s Cute Herdier | _________'s Cute Lillipup | Juanín EXTRA | Nugget So Cute!!!!! | Charmenzard | Puppy EX (cute) | SUPER CUTE GIRL | M cute pika EX | 4 Little Sheep | Cute Joltion | Cute Ezio | Cute kitten stampede | cute doggy | Cute Hamster | Cute Kiddiey | vote if you really cute | vote if you tink he is cute | cute creepers | select a size | cute kitten! | cute pikachu | cute girl | cute queen | Cute Pikachu | Cute Kitten | Cute puppy | lazy cute dog ex | CUTE PANDA!!!!!!!! !